*Dilly Dolls*: Winter is almost over, but I still have new boots! Winter is almost over, but I still have new boots! What can I say, I LOVE boots! I wear them year 'round, in rl! When my friends are putting theirs up in favor for flip flops, sandals and sneakers, I am still stomping around in my boots! Which is probably why I love making boots so much in Second Life! Today is no exception either! I have 6 brand new pairs for you to nab! 3 styles, 6 texture designs, 12 colors! Each is 100% original mesh, made by myself! 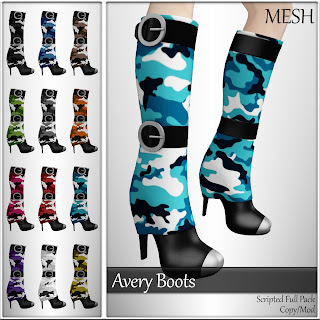 Avery is available in camo or leather styles. They also come with a color tinting HUD, for tinting the buckles and toe! Julia is available in lace or striped styles. And Dina is available in plad or leather styles. Demos for each, are available at the main store! Left click the main panel of the sign and choose "get demo"!